“Park vs. condos debate—costumes recommended,” reads one of the instructions on a playing card for a plot of land near the Los Angeles River. This tongue-in-cheek prompt for open-air theater comes from a recently launched initiative called Play the LA River. Every card in the Play the River 51-card deck focuses on points of interest along the river’s 51 miles and includes access maps showing parking, bike trails, bathrooms, and well-known neighborhood markers. Along with a short description of the site, the cards also list ways to play at each place. You could “leapfrog,” or “conga around the geodesic dome,” “write an ode to car exhaust,” play “korean poker,” or “smell the sage.” If that all sounds too complicated, you could always sketch or play a simple game of tag. Run by the arts collective Project 51, the project is what they call a “game of urban exploration and imagination.” The game’s goal? To help Angelenos understand that they now have a right to enjoy the river — long a polluted, concrete-encased ditch that is now on its way to becoming one of the city’s most treasured public spaces. “If you actually engage a place in an unlikely manner, you probably won’t forget it. It becomes yours,” says Catherine Gudis, a professor of public history and one of Play the LA River’s founders. 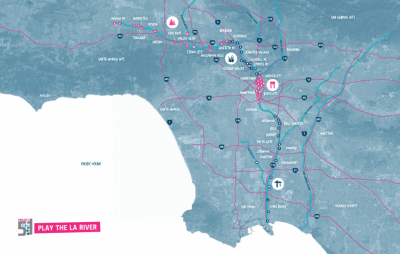 Building a sense of public ownership around the L.A. River is crucial right now. Thirty-two-miles of the long river snake through the city, running alongside and underneath various Interstate roads, through a number of different neighborhoods, ranging from working-class immigrant neighborhoods to wealthy enclaves. After decades of conversation, planning and activism about how to turn the polluted river into an amenity, the city is now moving forward with a $1 billion revitalization linear park plan that includes hundreds of thousands of square feet of open green space, bike paths, wildlife habitats and zoning guidelines that will allow for riverfront development adjacent to the park. By the time a plan was approved for the first eleven miles of the Los Angeles River last May, real estate developers were already advertising “prime riverfront property” in anticipation of the area’s transformation. New residences are mushrooming along former swaths of industrial no-mans-land, and some fear they may blockade public access to the river with private lots. Over the past few decades, grassroots efforts have revitalized discrete sections of the river with murals, lush walking trails, and boating. Numerous educational tours, cultural events, documentaries, and media coverage have focused on the river and its history as a natural waterway before it was channelized after severe flooding in the 1930s. But many locals, who’ve only glimpsed the dribble of mossy water stagnating in huge concrete channels from their cars, still tend to put the word “river” in quotes, if they acknowledge it all. 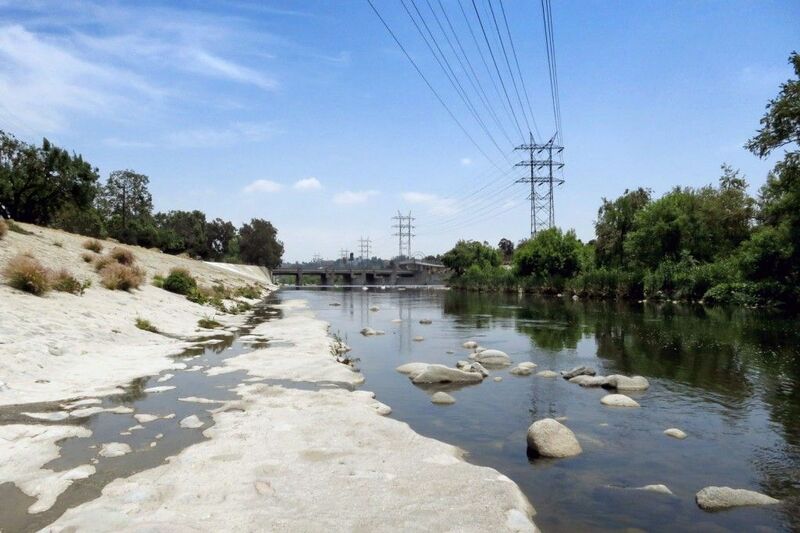 Over the next few months, the organizers will focus on river-adjacent communities in Southeast Los Angeles, an area burdened with greater pollution and poverty. Here, many parts of river are featureless cement canals as untouchable as the freeway it parallels. It “needs more love,” say Gudis and Price. In collaboration with local community groups, Play the LA River plans to co-sponsor several events and initiatives this year, from urban gardening to performances, to a group bike ride that will create a wish-list of new bike paths. The hope is that by helping local residents recognize the potential of the river, their demands will lead to the revitalization that upstream sections are getting. To put the river back into the public imagination, Gudis and Price wanted to create a geographic guide to introduce Angelenos to the river that has for so long been off-limits. But they wanted something playful, so they chose to create a deck of colorful cards, about 8 by 5 inches each, which are available to the public for free. They produced 5,000 decks and hope to make more. It was important for the cards to emphasize a DIYapproach to the river so the public could build their own relationship to it. Play the LA River’s website also hosts a community calendar on which the public can add their own tours and activities. “Playing at the river helps us think about what we want from that space. The more people engage on their own, the more likely it is that there will be a continuum of usage. The public becomes agents in an act of civic engagement with the river. Even the act of playing the river is political—it’s a claim to space,” Gudis tells me. Notably, the card deck and program of events Play the LA River co-hosts with art, river, and other non-profits, strive to intervene in parts of the river that have been overlooked. Disparities in land use, funding, and community resources are already threatening to create a divide between privileged and neglected sections of the river. Price, who has written about and advocated for the river for nearly fifteen years, views it as a symbol of larger problems Los Angeles faces, such as its division of neighborhoods by impermeable infrastructures, inequity of air quality, lack of park space, poor water management, and economic disparity. If the river is developed in a way that doesn’t address any of these issues, she feels it will be a huge loss. “The river is one of the most important keys to this city’s future,” she says. Such gestures—playful, theatrical, artistic—can build big momentum. In 1985, Lewis MacAdams, poet, activist, and founder of Friends of the LA River (FoLAR) cut a hole in a chain link fence and declared the river “open.” Thirty years later, some of it finally is. Playing the LA River now can lay the groundwork for residents to continue to gather, bike, relax, picnic, or smell the sage for years to come. Published in Next City for the column In Public.